Edward Gaming grab a real decisive win against H2K on the last day of the first half of the groups stages. Edward Gaming is now on the right path after a somewhat straight-forward win over H2K. Though the kills were close on the scoreboard for most of the game, rarely did we feel that H2K was pushing a lead or a win condition. EDG grabbed an early kill on Vander, after facechecking bottom lane bush, Vander was really low on health and stuck around in bot that led to Deft flash/healing and grabbing first blood. H2K did have a nice gank soon after, though, helping to give Forg1ven 2 kills early on on Ezreal. Here we saw a really nice play from EDG, with Scout roaming top they took down Jankos, and then after Odoamne pushed up just a tad too quickly, EDG came right back and took him down as well. One problem during the mid-game with H2K was their focus on grabbing kills rather than working the map. They made a 3-man dive onto the top-lane that was good in itself, but they lost half health on their mid turret, as well as Dragon. While they were up 5 kills to 4 during the mid game, they were down around 3,000 gold because of their lack of objective and map control. A big fight in this game came when Mouse somehow survived long enough to bring EDG into this fight, and it just shows H2K isn't finishing kills. Mouse delayed it and EDG came in to swoop the 5v4 advantage and continue to control the game. 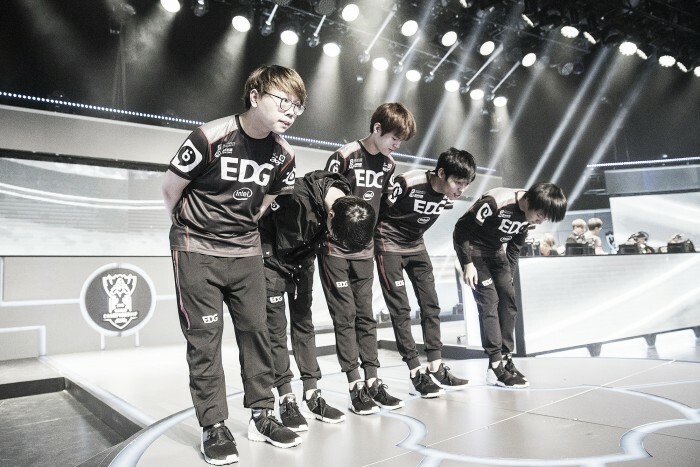 We've seen a bit from EDG to know at least where their identities lie. Clearlove and Deft need to carry and they hope Scout can roam top for Mouse when Clearlove can't. As for H2K, we're not sure what we have here. They are better than how they play, they make the right picks and compositions, but aren't translating kills or leads into map control and objective control. EDG has gotten their first decisive win and really earned this. Looking forward, we're starting to see EDG show up to this tournament, while H2K are starting to leave this tournament. Next week's implications have such a huge impact on H2K turning this around in 5 days.